We see the word so often. We may even use it thoughtlessly. I know I do. ‘Strategic analysis’ is easily defined: the collection and interpretation of data regarding the business environment of a firm, and reporting the conclusions to underpin a firm’s decision-making. When, however, we reflect upon the single, oft-used, word ‘strategy’, I realize that it is rarely properly defined. What is ‘strategy’? What does it mean in general, and what does it mean in a business context? Michael Porter’s 1996 Harvard Business Review article1, What is Strategy?, is the beginning of any search for the definition of ‘strategy’. It is, however, over two decades old. A newer book, published in 2013, has an imposing size (it runs to more than 600 pages) but an inviting title: Strategy, a history. The author, Sir Lawrence Freedman, has a background in military strategy but he also covers business strategy in this magnum opus. Not surprisingly Freedman shows that strategic thinking in business finds its roots in the military. Alfred D Chandler Jr was a 1960s pioneer in management science. He introduced strategy in business through adapting concepts of military strategic thinking, which he familiarized himself with during his tenure as teacher at the US Naval War College (Rhode Island). After Chandler, many others have defined strategy and its attributes. There is so much out there, that to me the only way to develop a view on strategy was simply to gather up a list of every definition I could find, and forge my own view from there. Conducting a meta-analysis of the list seemed the best way to capture the diversity of definitions and attributes of strategy. All too often a strategy is whatever the source wants it to be. The phenomenon of strategy has many attributes, with the attributes apparently being less elusive than strategy itself. This is not a new or an original conclusion: management thinker Henry Mintzberg described business strategy as an elephant. Consider the following: Put a quiet elephant and three blindfolded people in a room. Ask the people, individually, what they discover. One will find the trunk, another the tail and the third, a leg. Each of them is 100% correct when they describe the elephant as a tail, a trunk or a leg. Yet no one has the complete picture. According to Mintzberg this also applies to strategy and management. Attributes are what you discover but the whole picture may remain obscure. 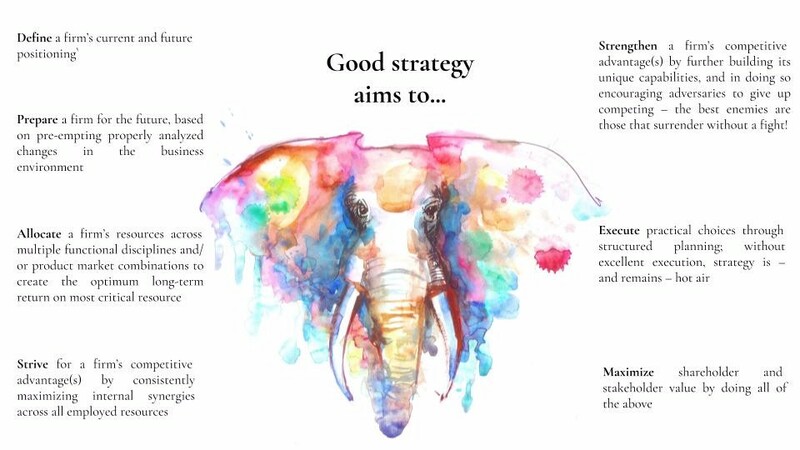 Now, when I create or review a business strategy, I use this homemade set of attributes as a checklist – if only to see whether we have seen enough of the elephant before confidently moving on to execution of the strategy. ‘Strategy’ is an umbrella term for a set of activities that connects a firm’s internal world of capabilities and resources to the opportunities and threats in the firm’s external world, in doing so permanently preparing and guiding the firm for action. Even when, in a fast-moving consumer goods (FMCG) industry such as the one in which Unilever operates, the strategies of various competitors converge to become a single industry best-practice, I still believe Polman is slightly underplaying things. Truly distinctive companies always have unique and often innovative strategies. Moreover, even in a more mature industry segment like FMCG where competition is cutthroat, the last “five or ten percent of the work” might still make the difference between sustaining success and near-future obsolescence. When the above checklist contributes to postponing that obsolescence a bit, a lot has been gained. 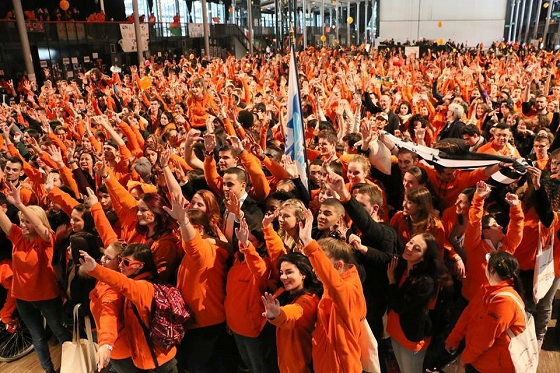 Every successful social movement requires three distinct leadership roles: the agitator, the innovator, and the orchestrator, according to institutional change expert Julie Battilana. What determines whether a social movement will be a flash in the pan or a real catalyst for longterm change? Why did Occupy Wall Street subside in a matter of months, for instance, while the American Civil Rights Movement thrived, resulting in the passage of multiple laws? Julie Battilana, a long-time scholar of institutional change, has identified common themes among those social movements that don't merely broadcast the need for a social change, but actually create long-term impact. According to Battilana, every successful social movement features three distinct leadership roles: the agitator, the innovator, and the orchestrator. Any successful pathway to societal change requires all three, as Battilana explains in the article Should You Agitate, Innovate, or Orchestrate? Understanding the Roles You Can Play in a Movement Toward Societal Change, co-written with Marissa Kimsey, a research associate at HBS. The article appears in the new issue of Stanford Social Innovation Review. The Agitator stirs the pot by articulating and publicizing societal grievances, rallying an otherwise diverse group of people around a mutual desire for change. "IF YOU DO NOT INNOVATE AND HAVE A SOLUTION TO THE PROBLEM YOU’VE IDENTIFIED, THE MOVEMENT WILL DIE "
Take, for example, marine biologist Rachel Carson, who alerted the public to the dangers of pesticides in the 1950s; Donald Trump, who, throughout 2016, rallied citizens around the slogan “Make America Great Again;” or Teresa Shook, who launched the Women’s March on Washington after Trump’s presidential victory. The Innovator develops a solution to address the grievances. That means anticipating roadblocks and coming up with alternative paths, as well as justifying those alternatives in appealing ways to engage individuals, groups, and organizations to support them. Without leaders who can lay out a persuasive path of innovation, a movement will never make it past the agitation stage, Battilana argues. The Orchestrator spreads the solution created by the innovator, continually strategizing how best to reach and work with people both within and outside the movement, as the movement for change grows in size and complexity. Battilana and Kimsey explain that each role requires a combination of communicating, organizing, and evaluating. Agitators need to communicate the necessity of the social change movement; innovators need to communicate the validity of their proposed solution; and orchestrators must be able to tailor information to different types of constituents—sometimes different groups all over the world—while still maintaining a cohesive message. Agitators must also organize and launch a collective action against the status quo; innovators must build a coalition of support behind their ideas; and orchestrators must expand and sustain the collective action. Among agitators: fragmented agitation—triggering multiple areas of outrage that can’t work together as a cohesive cause, and a stalled solution—raising a valid complaint but lacking a remedy to offer. Among innovators: tunnel vision—failing to consider the negative implications of a proposed solution, and impractical elegance—proposing a solution that looks great on a computer screen but is virtually impossible to orchestrate. Among orchestrators: mission drift—losing sight of the envisioned social change, and dilution—watering down the movement to the point that it no longer addresses grievances. Battilana has advice for avoiding potential traps and how to determine when to play which roles. Keys include continually assessing progress and changes in the environment, as well as the understanding the individual’s sources of power and motivations. Power may come from personal sources (e.g., charisma, expertise); positional sources (e.g., holding official leadership roles, elected or appointed); and relational sources (connections with family, friends, and colleagues). “Leaders leverage these various sources of power as they push for change,” Battilana and Kimsey write in their article. "MOST MOVEMENTS ARE FULL OF HIDDEN HEROES"
Battilana also warns that effecting change does not guarantee glory. Behind any successful movement lies a great deal of thankless determination and sweat. As global markets push businesses to become more agile and responsive, it’s tempting to predict that management roles will virtually disappear from progressive companies. But even Holacracy (a self-management structure made famous by online shoe retailer Zappos) has some hierarchy: Instead of “managers,” there are “lead links” who carry leadership functions and oversee new teams as they form and disband with each project cycle. While widespread adoption of Holacracy is not likely in the near future, many organizations are shifting towards more flat structures where teams are gaining in importance. Among 10,000 business and HR leaders, 94 per cent report that agility and collaboration are key to their organization’s success, and 32 percent say that they are designing their organization to be more adaptable and team-centric, according to Deloitte’s 2017 Global Human Capital Trends report. If your business is moving towards a dual management structure system, gaining clarity around hiring, compensation, and performance will become even more important. With fluidity comes a certain degree of murkiness, and thus objectively measuring manager effectiveness will become even more complex. Because the two types of managers serve two very different roles, they need to be measured in very different ways. A mission manager’s primary function is to get the project delivered on target, while an administrative manager is more focused on an employee’s skills and career development. Knowing how to measure the different types of leaders will put you in a position to guide your organization through success as it strives to become more responsive to market pressures. Here are two distinct sets of metrics for each type of manager. The old adage is true: “people quit their bosses, not their jobs.” Because time with a project or mission manager is relatively short — six months or less — employees will gauge their relationship with the organization through their traditional people manager. This means that for administrative managers, it’s important to use metrics that will help you answer questions like: Which managers retain the most top performers? Which managers grow the best employees? From there, you can look to groom more managers like them, have conversations with those who need improvement, and make sure your best managers are guiding your most critical employees. Managers are not the only factor influencing employee engagement, however they are pivotal because of their opportunity to understand and support employee engagement at an individual level. 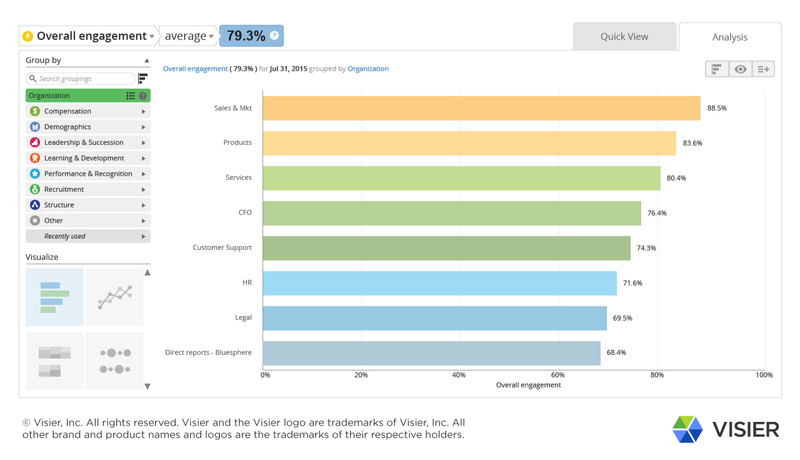 Most engagement survey processes have a specific series of questions that look at how employees view their supervisor. Understanding and using this score to build a complete view of manager effectiveness is important. The most common way this score is generated is by calculating the mean scores for a series of survey items related to the supervisor relationship. When a manager’s engagement score is significantly lower than similar work groups in the organization, this is an indication that the manager is falling short. Analyzing this score alongside high performer turnover or absence rates will give you a good idea of how big an impact the manager is having on the team. Low engagement coupled with high resignation and/or high absence rates means that action is required to improve the dynamics of that work group. It is also worth doing some investigation based solely on low engagement, as this may be the first sign that resignations and absences will follow. A general turnover metric — which also incorporates the turnover of poor performing employees — is too broad to support good quality decisions about management skills. Instead, examine the resignation rate of high performers to see if specific managers or work units are losing more high performers than others. Chose a time frame (e.g. previous 12 months). Count all the high performing employees who resigned. Calculate the average headcount for high performing employees. Divide the number of high performers who resigned by the average high performer headcount. Whenever the high performer resignation rate is greater than the overall resignation rate, it signals a problem that needs to be addressed. If you are losing high performers more quickly than your general employee base, this means your overall talent quality is reducing, which is likely to lead to productivity and quality challenges some time in the future. If the rates for certain managers are substantially higher than other managers, this is an indication that all is not well in that work group. Although it would be too simplistic to assume the manager is the sole cause, it is an indicator that further investigation and insight is needed. Classic promotion metrics simply look at how many people in a group have received a promotion. This does nothing to indicate whether or not they were promoted within the group or came to the group from somewhere else. When trying to understand whether a manager is good at growing talent or not, you need to understand how many of their people were promoted — both within their team and externally to another team. For this purpose, look at your promotions actioned, which calculates the number of people who were promoted from a specific work group and gives a true picture of the manager’s ability to develop promotable staff. By looking at promotions actioned across your organization, you can see from which work units and managers more people than average are being promoted. This indicates which managers are more effective at growing talent. Identify all of the people who had a promotion within that timeframe. Allocate that promotion event to their location / work unit at the start of the time frame – (where they were promoted from, not where they were promoted to). Divide the number of promotions by the average headcount in the workgroup to create a rate. Managers who consistently have a low or zero promotions actioned rate may be talent hogs. These people hold back team members to make sure their results get delivered, at the expense of the employee and the organization overall. A rate that is low compared to others, or zero, should be a reason to investigate further and clearly identify why this manager is not able to build staff who can progress through the organization. The amount that an organization spends on people in professional services or technology companies ranges from 60 to 80 cents of every dollar. Even with the best financial controls in place, managers play a key role in managing the ad-hoc, off-cycle increases to base pay, as well as the use of variable or supplemental pay to incentivize employees or cover peaks in demand. The primary job of a manager is to get the work done with the resources provided — whether these are financial resources or human resources. Understanding how closely the people costs of a work unit match the plan provides insight into how well a manager is doing at stewarding resources. Align your planning and analytics to use the same basis for modelling people costs (e.g. direct compensation for both includes base pay, variable pay, supplemental pay, etc.). Publish your planned direct compensation for each work unit. Calculate your actual direct compensation from pay data. Subtract your actuals from your plan. Convert the sum of the difference into a percentage variance (e.g $10 over a $100 plan costs is 10% variance). Managers should not be expected to constantly hit their plan targets precisely. This level of accuracy suggests too high a focus on costs. However, if there is a variance above plan for several months, or if the variance is higher than 2-3 percent, then it indicates the need to do some more detailed analysis into what is causing the variance (for example, is the variance due to big increases in base pay due to new hires, or is it due to high supplemental pay payouts as the result of increased work volumes?). A variance does not always indicate a negative situation, but it does indicate the need for investigation. Absenteeism is often a “sleeper” issue that, when monitored, can provide great insight into which managers are demanding too much of their people or have an engagement problem. There is a level of absence which is “normal” — everyone gets sick sometime. Monitoring this metric is about identifying patterns that do not fit with what is expected and understanding what is causing this abnormal behavior. Count the number of days absent during the time frame. Calculate the number of Full Time Equivalents working in each work group. Divide the number of days absent by the number of FTEs (this gives you a “normalized” or common score that can be compared across work groups). There are two clear indicators that the behavior of a work group is not effective and that further investigation is required. The first is a consistent level of absence above the average for similar work groups. Absence rates do increase with age, so you need to check if one group is substantially older than another. But in general, absence patterns should be consistent across groups doing similar work with similar demographic make ups. The mission manager is essentially a project leader who is task-focused. Successful mission managers are strong communicators who can motivate people and coordinate many moving parts at once to meet project goals. Once you understand who the top performing mission managers are, you can then be strategic about who gets assigned to lead the most critical or complex projects. A project manager who drives people to hit mission objectives without consideration for the team’s general well-being can create widespread burnout within the organization. This kind of “all or nothing” attitude can hamper engagement, drive up absenteeism rates, and have a negative impact on retention. Therefore, a mission manager’s engagement score needs to be considered as part of the bigger picture. If your organization typically only evaluates traditional managers who are tied to functional departments, you may need to change the way you capture your engagement data to include mission managers. Add questions to engagement surveys about the employee’s relationship with the mission manager specifically. To create a rolling score over time, include an assessment of the manager at the end of each mission. One bad engagement score related to a specific mission may simply mean the mission manager was learning something new, and is not necessarily reflective of overall performance. However, when a team leader’s score is consistently low — and particularly when this is coupled with high absence rates — it is an indication that he or she could be burning out employees. Most organizations move towards a more mission-focused structure so they can deliver specific outcomes (such as new software releases) within shorter cycles. This means that getting projects completed on time and within a specific scope is paramount. The on-target delivery metric to help you evaluate how the mission manager is hitting these two objectives. A common theme of project over-runs indicates that a manager may be having difficulty getting team members to rally around a delivery date. Also, if you see that the team is not on target but that employees are working overtime, you need to drill further by having a conversation with the manager and the team members, as there are many factors that could be contributing to the problem. You also need to consider the difficulty level of the mission; some are more complex because they have an undefined scope. If the different missions are rated by difficulty when the data is inputted into the project management system, your insight will be that much richer. Skilled mission managers who can organize projects and run teams are tremendous assets. They can evaluate interdependencies of tasks and skills and ensure they are lined up to deliver on the project objectives. The labor utilization variance will help you evaluate whether the manager was efficient in how he or she deployed people. Calculate the percentage variance between actual hours and allocated hours e.g. 110 actual hours vs 100 allocated hours = +10% variance. If you see that team members have to put in more hours than expected on a regular basis, it could be an indication that the mission manager is struggling to assign people the right tasks, or has difficulty planning complex projects. The role that managers play is crucial to the output of the organization. More often than not, businesses rely heavily on the knowledge and commitment of employees. The administrative manager plays a pivotal role in bringing out the best in people long-term, while effective mission managers can skillfully lead a team through challenging, complex projects on tight deadlines. Whenever you perform an analysis of manager effectiveness — whether it’s for an administrative or mission manager — it is important to use metrics to narrow down areas of focus and potential issues. At the same time, remember the metric is not the answer, it is the guide towards a deeper understanding of how the human dynamics in your organization either drive or hinder organizational success. By monitoring and analyzing manager effectiveness, you will be in a good position to identify where your management team is strong and where further insight is required. When this is combined with recruitment optimization, you can drive strategy and better business outcomes through talented, engaged people. As Artificial Intelligence (AI) enters the workplace, business leaders need new skills to rise to the challenges and opportunities presented by this disruptive new technology. Task automation is a key area for AI applications. Roles traditionally thought of as requiring a high level human intellect are now being automated. The legal profession is seeing such disruption through AI: automating searches for legal precedents and case reviews, creating and adapting contracts, predicting litigation outcomes, and organising workloads. Whilst AI can boost efficiency, decision makers must be mindful of how this may impact brand identity and user experience – and where it is still critical to maintain human involvement. As similar smart automation is deployed by competing businesses, there’s a risk of commoditisation. How firms stand out and maintain personality will be a critical consideration; the real pay-off comes from deploying the technology to unleash human potential and take our businesses to the next level – rather than simply automating what we have to reduce costs. Although the technology is potentially complex, the critical success factor for business leaders and managers is to focus on the human dimension. How will staff respond when their jobs are changed drastically or eliminated? How will we mitigate the worries or stress that the introduction of AI may cause? What new skills might employees need? What responsibilities do employers have for those displaced by technology –some analysts estimate that 80% of current jobs could disappear within 20 years, and others project that for each job created in new firms and sectors, three or more will be eliminated elsewhere. So, what do leaders need to understand and pay attention to as their organisation embarks on the AI journey? What training may they need to make the most of the opportunities without ignoring the human factor? And who should lead the implementation of AI within the business? It may be natural to think that the IT department should be the driving force behind business adoption of AI. However, the increasingly strategic nature of the decisions embedded in the choice to deploy AI may be seen as sitting more in the realm of the COO, CEO or heads of business units and functions. Importantly, the learning to support these leadership decisions can be drawn from a multitude of different places. Industry associations, conferences and events, can facilitate learning and networking opportunities, vendors can share their experience and advice, discussions with other organisations who’ve experimented with AI can allow us to tap into their knowledge and experience, and science and technology graduates can intern to bring technical expertise and fresh perspectives to a firm in exchange for business experience. By gaining a better understanding of AI and its implications it will be easier to make decision about how narrowly or how deeply to deploy AI within the business. AI can be used narrowly to automate a single task or apply rule based thinking to a process or outcome, or it may be used to automate entire departments e.g. customer service. How deep to take AI will depend on the goals, priorities, resources, and values of the firm and where it sees the place of humans in service, innovation and sales. Leaders also need compassion and the ability to engage staff in the transformation process. There is a growing risk that firms will become over-reliant on technology and ignore the value of humans. Smart technology will increasingly replace even complex roles; however, it will be some time before it can outperform humans in problem solving, creativity, negotiation, collaborative design, conflict resolution, and crisis response. Digital transformation initiative typically fail as a result of paying too little attention to the human and cultural aspects of change and their place in the future solution. Hence, we need to think about how to invest in staff to maximise their potential with technology as an enabler, how to care for those whose roles and departments are being disrupted by AI, and how to raise everyone’s digital literacy so they understand the nature of the technology that is bringing about such change in their world and the possibilities it enables. Training may be necessary to facilitate the transition to working in an AI-centric firm; something akin to cultural or sensitivity training to allow employees to become accustomed to the new technology. HR may have a greater role to play in professional development; for example, a senior manager whose job is being fundamentally disrupted for the first time in their career may need a degree of retraining and emotional support. Soft skill training may become more and more important as leaders and their teams will need to hone skills like sensitivity, creativity, verbal reasoning and communication, empathy and spontaneity. HR or a new Department of Humanity can facilitate this aspect of personal development to ensure that businesses make the most of the interplay between human and artificial intelligence. In order to preserve the human element of your business in an automated climate, what will act as a key differentiator? Careful decisions about which roles and functions to automate should guide AI strategy—a simple “bottom line” approach will compromise the human element and could erode the firm’s uniqueness over time. It will also be important to show compassion and support to employees displaced by new technology. The gifts from AI to society include smarter decision-making, the capacity to draw new insights from vast arrays of data, the potential for cost-saving replacement of humans, and efficiency-oriented high-volume applications which are simply beyond human capacity to execute in a meaningful timeframe e.g. scanning literally millions of websites in an information search. However, a sweeping implementation of AI without regard for the impact on employees would be bad internal PR at the least, and could actually have devastating consequences in terms of customer appeal and local reputation for a business. Ultimately the future of work and the future of society are deeply entwined. Our sense of place in society, our worth, our contribution and our legacy are often predicated around our work. Anything that starts to disrupt that relationship between work and individual identity is going to have far-reaching impacts. On the plus side, humans have proved themselves to be remarkably adaptable. So, while the idea of working side-by-side with a robot may at first be unsettling, a small step back reminds us that we already work and relate with AI and “smart” machines every day. For example, predictive text is a form of AI software which most smartphone users have adjusted to. When sending emails or texts on devices, or running an internet search, we expect, to some extent, that our intention will be perceived. The AI companions that will join us in the workforce will be preoccupied with learning about us to try to make our lives better. Just as the predictive text on your phone doesn’t send runaway messages (usually) and the internet search bar sometimes knows you better than you know yourself, we as a society should anticipate AI’s helpful (if sometimes at first clunky) role in the workplace over the coming decade. Technological tools provide a new opportunity for the function to reach its potential and drive real business value. A leading US healthcare company was struggling recently to recruit more nurses and stem high staff turnover. Patients were suffering, and the crisis was beginning to hit revenues. Instead of just continuing to “firefight,” however, the company’s human-resources department responded by launching an in-depth analysis of the tenures in the group’s nursing population, noting in its study some surprising correlations between length of service, compensation, and performance. HR leaders quickly saw the source of the problem—as well as a solution. They raised the minimum rewards for those early in their tenure and tweaked the total rewards for those with longer career paths, with the result being that the company retained more early-tenure, high-performing nurses. When the company rolled out the plan more widely, employee engagement increased and productivity jumped by around $100 million. The story shows what can happen when HR steps out of its traditional silo and embraces a strategic role, explicitly using talent to drive value rather than just responding passively to the routine needs of businesses. That’s a transformation many companies have been striving to make in recent years as corporate leaders seek to put into practice the mantra that their people are their biggest asset. Some companies are making progress. The best HR departments are creating centers of excellence (COEs) in strategic areas such as organizational development, talent acquisition, and talent management. They are also providing better support to line managers via strategic HR business partners, and gaining points for pulling up from administrative minutiae to work on the long-term health of the business. But there is still a long way to go. We hear continued frustration from business and HR leaders alike that the value of the much touted “strategic” approach remains at best unquantified, at worst ill-defined and poorly understood. Too many HR organizations still fail to make a hard and convincing connection between talent decisions and value. This article sets out an agenda for renewed action. We believe the time is right to accelerate the reinvention of HR as a hard-edged function capable of understanding the drivers of strategy and deploying talent in support of it—most importantly as a result of the availability of new technological tools that unleash the power of data analytics. The starting point is for HR business partners—those senior HR individuals who counsel managers on talent issues—to stop acting as generalists and show that they really own the critical talent asset. This is a big enough change that it calls for a change in roles: replacing the business-partner role entirely with a new talent value leader (TVL), who would not only help business leaders connect talent decisions to value-creating outcomes but would also be held fully accountable for the performance of the talent. A TVL should have real authority over hiring and firing, even if actual decision rights remain with managers in the way actual spending decisions are taken by budget owners rather than being dictated by the finance function. Think of the manager of a European football team who is responsible for allocating resources using acquisition, compensation, evaluation, development, motivation, and other levers to maximize the players’ collective performance. Unlike the typical HR business partner of today, TVLs should be held to account using metrics that capture year-to-year skills development, capability gaps, engagement, and attrition. And to the maximum extent possible, they should be disconnected from the day-to-day concerns of operational HR so as not to get pulled back into dealing with employee issues—that means eliminating the HR liaison role that so many HR business partners play today. TVLs, however, won’t succeed without being able to deliver analytically driven talent insights to business managers systematically. This is a substantial change from today; while many HR business partners are resourceful and smart advisers to managers, few possess a data and analytical mind-set or the appropriate problem-solving tool kit. When adopted, the expanded HR role we are describing starts to be taken seriously, as some companies are beginning to discover. A leading global materials company, for example, has been moving in this direction, specifying competencies for its HR leaders that now include the ability to “use analytics to diagnose and prescribe talent actions,” to “translate talent decisions into profit-and-loss impact,” and to “measure talent outcomes and their impact on value while holding managers accountable.” The results have been significant. After an adjustment period, internal surveys show managers are substantially more satisfied with the support they receive from HR. Anecdotally, we also hear that more business leaders are scripting a role for their talent advisers during the strategic business-planning processes. A key challenge, of course, is where to find appropriate candidates to fill these bigger HR shoes. Many business partners, after all, have grown up in traditional HR roles with an operational-service culture. HR departments should therefore start a cohort-based, high-potential program that balances rotations in and out of HR with dedicated time for skill building. Companies can also reward executives from other functions for stints in HR, and potential HR leaders should experience line and other functional-leadership roles—in finance, for example—in order to build better business-strategy capabilities. Eileen Naughton recently stepped in to run people operations at Google from her role as managing director and vice president of sales and operations in the United Kingdom and Ireland. And Pepsico has begun to fill some HR roles with people from engineering, technology, or process-oriented backgrounds: leaders at the soft-drink giant say that engaging the business with data is critical to expanding the strategic role of HR. Many organizations have already built extensive analytics capabilities, typically housed in centers of excellence with some combination of data-science, statistical, systems-knowledge, and coding expertise. Such COEs often provide fresh insights into talent performance, but companies still complain that analytics teams are simple reporting groups—and even more often that they fail to turn their results into lasting value. What’s missing, as a majority of North American CEOs indicated in a recent poll,1is the ability to embed data analytics into day-to-day HR processes consistently and to use their predictive power to drive better decision making. In today’s typical HR organization, most talent functions either implicitly or explicitly follow a process map; some steps are completed by business partners or generalists, others by HR shared services, and still others by COE specialists. Many of these steps require a recommendation or decision by a human being—for example, the evaluation of an employee’s performance or the designation of a successor to a specific role. Embedded analytics, by contrast, either inform or replace these steps with algorithms that leverage the data to drive fact-based insights, which are then directly linked to the deployment steps in the process. For example, many companies now use HR analytics to address attrition, allowing managers to predict which employees are most likely to leave and highlighting turnover problems in a region or country before the problem surfaces. By making the development and delivery of insights systematic, HR will start to drive strategic talent value in a more consistent way, rather than episodically and piecemeal as at present. To understand more concretely the role of people analytics in an HR organization’s journey toward a more strategic role, let’s look closely at a single process—succession planning—and then assess the potential business impact of a broader suite of initiatives. A standard approach starts with a talent-management or organizational-development COE laying out the process for the organization, designing the tools or templates, and training key stakeholders in what to do. Managers might then sit down with their HR partners and discuss potential succession candidates for key roles—ideally taking skills, competencies, and development pathways into account (in practice, of course, there may be a bit of “gut feel”). A traditional best-practice process would then create individual development plans for potential successors, based on the gap between that person and the potential role. As vacancies occur, these potential successors may or may not be tapped, much depending on whether the manager (or his or her HR partner) bothers to refer back to those plans. An analytics-driven succession-planning process looks and feels very different. First, machine-learning algorithms might review years of succession data so as to understand success factors in a given role. Using that insight, the company might then derive the top five internal candidates for that role, accompanied by customized development plans (that is, what courses to take, what skills to build) based on their individual competencies. Such information would support subsequent strategic decisions, consultations between managers and strategic HR partners, and cross-functional assessments of enterprise bench strength. The real prize is for those that can use data analytics not just to improve a single process, like recruitment or retention, but also to drive business performance—as has happened at a leading global quick-service restaurant business. The company mined data on employee personality traits, leadership styles, and working patterns and introduced changes that have improved customer service and had a tangible impact on financial performance (see “Using people analytics to drive business performance: A case study,” forthcoming on McKinsey.com). To achieve such impact across the board, leaders will have to make significant investments in analytics skills and capabilities—but the returns should be commensurate. Based on a study of a range of industries with diverse workforces, operating models, and financial features, the McKinsey Global Institute estimates that companies using a portfolio of HR-analytics solutions could realize an increase of 275 basis points in profit margins, on average, by 2025. These increases will likely come about through productivity gains among front- and middle-office workers (which can translate into revenues or other increased-output opportunities) and through savings in recruiting, interviewing time, training, onboarding, and attrition costs. The current reality of HR, as many business partners will attest, is that of the function routinely being pulled into operational issues and distracted from its core strategic mission. McKinsey research, indeed, shows that typical HR departments still spend close to 60 percent of their time and resources on transactional and operational HR, despite decades of pushing work out to shared services; the best-performing HR departments spend less than 40 percent of their time and resources on these transactional activities. As part of its continuing transformation, HR must therefore raise service levels and improve the employee experience, using next-generation automation tools and standardized processes to drive higher productivity. There are three critical operational priorities for the HR organization of the future: continuous process improvement, next-generation automation technology, and user-experience-focused service improvement. Based on our work with companies, we see several ways to make HR operations more efficient—including finding further things that individuals and managers can do more easily themselves—notably by providing direct access to information or transactions online, introducing simpler processes, and ensuring clearer decision making. It’s also worth considering more geographically diverse sourcing of work and talent, as a leading agricultural company did when it found deep pockets of high-end instructional design talent in several Indian cities. These people, it turned out, not only were less costly but proved themselves capable of delivering equal or better service than the relatively well-compensated instructional designers who had served the businesses previously, mostly from the United States and Western Europe. There is always scope for smarter sourcing of external vendors, whether through insourcing or outsourcing: one US insurance company, for example, improved its reliability and cut the overall cost of its payroll process in half by bringing it back in-house. New automation technologies will soon reshape a number of HR processes, building on core human-resource-management-system platforms (both on premises and in the cloud). Robotic process automation (RPA), smart work flows, cognitive agents, and natural-language processing, for example, will automate HR tasks previously carried out by people. The case of a leading global automotive-component manufacturer that was struggling with its employee-onboarding process is instructive. Thanks to the cross-functional complexity of the work flow, with different HR people needed to complete steps such as employee paperwork and scheduling orientation—and with IT, facilities, and security people needed to complete others—onboarding used to take weeks. RPA solved the problem with a bot that can access multiple systems, follow an intelligent work flow, and initiate communications. Onboarding time, on average, has been reduced by more than two-thirds, many errors created by manual tasks have been eliminated, and the journey has become more compelling for the individual. For operational HR, the new frontier of technology is cognitive agents, especially when paired with natural-language processing. The former have developed to the point where in many cases employees can’t tell that they’re interacting with a piece of software. Natural-language processing may not yet offer seamless unstructured voice conversations for an HR setting—but leading HR-service organizations already leverage chat as a communication channel to answer most questions, “learn” from past interactions, and conduct “warm” handoffs when needed. One major international food and beverage company believes these automated technologies can reduce its costs by 20 percent while maintaining or increasing service levels (for instance, by enabling 24/7 immediate response). Operational effectiveness is a critical part of employee satisfaction with HR. But whether it’s understanding the customer decision journey in marketing or understanding user needs as the foundation to driving digital user experience, other areas of the business have sought to improve customer satisfaction in ways that most HR departments generally have not. The HR department at the Orlando International Airport is a notable exception. It found that staff employed by about 60 organizations based at the airport, ranging from airlines and security to retail and janitorial, faced a common set of challenges. These challenges were both undermining the employees’ job satisfaction and affecting the quality of services they were providing for passengers and other customers. An overhaul of the staff experience tackled both problems. The airport revamped its shuttle-bus schedules, reducing commuting time for workers using the employee parking lots, which had a tangible effect on morale at the start of the day. The airport also made it easier for employees to find their way through its buildings and facilities. Finally, it took an entirely new approach to onboarding employees, providing them with updated weekly information so that everyone, regardless of their role, could help customers with queries about directions, the availability of services, or events taking place in other parts of the airport. The changes discussed not only require the HR organization to recruit a new cadre of TVLs and to use people analytics to drive business value—they also demand a new type of agile organizational structure. Applying agility to the organization of HR will be critical to HR’s ability to deliver a harder link between talent decisions and value. It’s easiest to understand HR agility through an example. A leading European bank implemented an agile HR model aligned to this vision, with great results. Previously siloed HR resources responded to opportunities or issues slowly and inefficiently, their work dominated by transactional and operational tasks. Morale was low as a result of a lack of role clarity and a surfeit of meetings aimed at engaging every conceivable HR stakeholder. In response, the bank’s HR leaders implemented an agile “flow to the work” organizational model: there are a limited number of deep specialists and talent value leaders in a few global roles, and they are supported by strong shared-service centers and a pool of multiskilled HR professionals—people with capabilities to perform most HR actions and who are responsible for much of the talent work. The model reduced the HR budget by 25 percent in its first year of implementation, the goal being 40 percent within three years. Just as important, the HR organization is working with renewed purpose, implementing key talent initiatives faster and substantially accelerating HR’s response to opportunities and issues. Now fewer in number, the bank’s HR business partners (TVLs in all but name) and COE leaders are devoting much more of their time to connecting talent to business strategy. As this example suggests, the move toward a more agile HR organizational model has both operational and structural implications. Operationally, HR functions need to be able to create a solid backbone of core processes that either eliminate the clutter or camouflage the complexity to the business, all while delivering the basics (such as payroll, benefits, recruiting, and simple employee and manager transactions) without error or delay. Agility, combined with analytics, also suggests structural change, particularly for centers of excellence. With more automation of insight generation, and especially the mass customization and delivery of those insights through technology, HR COEs will probably be a much smaller group in the HR organization of the future. Shorn of transactional resources and unburdened by operational responsibilities, these pools of talent will be able to work across disciplines (talent management, learning and development, and organizational design), supporting the new talent value leaders and business as a whole (exhibit). Calls for a more assertive and strategic role for HR are not new. The idea that the CHRO (controller of human capital) should be part of a C-suite triumvirate that includes the CEO (principal owner of strategy) and the CFO (owner of financial capital) has been championed by our colleague Dominic Barton, among others. But if HR leaders are to finally achieve the promise of being strategic—the sustained delivery of talent insights and actions that drive real business value—they will need to transform their own function to provide a foundation. By changing the way HR interacts with the business on strategic questions, notably through the creation of new talent value leaders, HR can gain responsibility and accountability for driving talent-linked value. By deploying data-driven insights and solutions in a systematic way, HR can dramatically ramp up the level of talent insight it delivers to the business. By driving continuous improvement in operational performance, HR can create the space for its leading thinkers to drive strategic talent insight and solutions. And by adopting a more agile approach to its resources, HR can drive significant productivity and focus execution and investments on the core initiatives each year that are proven to link to value. Agile leadership and AI both depend on learning to let go. Consider this real-life scene: Reflecting on the difficult moments of his week, the new CEO of a UK manufacturer felt angry. His attention kept going back to the tension in several executive-team meetings. He had an urge to shake the team and push several of its members, who were riven by old conflicts, to stop fighting and start collaborating to solve the company’s real problems. He also sensed, though, that a brute-force approach was unlikely to get very far, or to yield the creative insights that the company desperately needed to keep up with its fast-changing competitive environment. Instead, he calmed himself, stopped blaming his team, and asked himself whether he could break the logjam by pursuing truly new approaches to the company’s problems. It was then that his mind turned to, of all things, artificial intelligence. Like many leaders, the CEO was struggling to cope with the stress induced by uncertainty, rising complexity, and rapid change. All of these are part and parcel of today’s business environment, which is different enough from the one many of us grew up with to challenge our well-grooved leadership approaches. In a recent article, we described five practices that can help you step back from the tried and true and become more inwardly agile (see “Leading with inner agility”). Here, we want to describe the relationship between some of those ideas and a technology that at first glance seems to add complexity but in fact can be a healing balm: artificial intelligence (AI), which we take to span the next generation of advanced data and analytics applications. Inner agility and AI may sound like strange bedfellows, but when you consider crucial facts about the latter, you can see its potential to help you lead with clarity, specificity, and creativity. The first crucial fact about AI is that you don’t know ahead of time what the data will reveal. By its very nature, AI is a leap of faith, just as embracing your ignorance and radical reframing are. And like learning to let go, listening to AI can help you find genuinely novel, disruptive insights in surprising and unexpected places. A second fact about AI is that it creates space and time to think by filtering the signal from the noise. You let the algorithms loose on a vast landscape of data, and they report back only what you need to know and when you need to know it. Let’s return to the CEO above to see an example of these dynamics in action. The CEO knew that his company’s key product would have to be developed more efficiently to compete with hard-charging rivals from emerging markets. He urgently needed to take both cost and time out of the product-development process. The standard approach would have been to cut head count or invest in automation, but he wasn’t sure either was right for his company, which was exhausted from other recent cost-cutting measures. All this was on the CEO’s mind as he mused about the problematic executive dynamics he’d been observing—which, frankly, made several of his leaders unreliable sources of information. It was the need for objective, creative insight that stoked the CEO’s interest in AI-fueled advanced data analytics. A few days later, he began asking a team of data-analytics experts a couple broad and open-ended questions: What are the causes of inefficiencies in our product design and development workflow? What and where are the opportunities to improve performance? The AI team trained their algorithms on a vast variety of data sources covering such things as project life-cycle management, fine-grained design and manufacturing documents, financial and HR data, suppliers and subcontractors, and communications data. Hidden patterns in the communication networks led to a detailed analysis of the interactions between two key departments: design and engineering. Using aggregated data that didn’t identify individual communications, the team looked at the number of emails sent after meetings or to other departments, the use of enterprise chat groups and length of chats, texting volume, and response rates to calendar invites, the algorithms surfaced an important, alarming discovery. The two departments were barely collaborating at all. In reality, the process was static: designers created a model, engineers evaluated and commented, designers remodeled, and so on. Each cared solely about its domain. The data-analytics team handed the CEO one other critical fact: by going back five years and cross-referencing communications data and product releases, they provided clear evidence that poor collaboration slowed time to market and increased costs. By liberating the AI team to follow a direction and not a destination, the CEO’s original question, “How do we improve productivity?” became a much more human, “How are we working as a team, and why?” Based on this new empirical foundation, he enlisted the engineering and design leaders to form a cross-disciplinary team to reimagine collaboration. Working with the data scientists, the team was able to identify and target a 10 percent reduction in time to market for new-product development and an 11 percent reduction in costs. But the CEO didn’t stop there. He also used the experience to ask his executive team to develop a new agility. The previously fractured team worked hard to build a foundation of trust and true listening. Regular check-ins helped them pause, formulate new questions, invite healthy opposition, and ask themselves, “What are we really solving for?” The team was growing more complex to address the company’s increasingly complex challenges. In our experience, AI can be a huge help to the leader who’s trying to become more inwardly agile and foster creative approaches to transformation. When a CEO puts AI to work on the toughest and most complex strategic challenges, he or she must rely on the same set of practices that build personal inner agility. Sending AI out into the mass of complexity, without knowing in advance what it will come back with, the CEO is embracing the discovery of original, unexpected, and breakthrough ideas. This is a way to test and finally move on from long-held beliefs and prejudices about their organization, and to radically reframe the questions in order to find entirely new kinds of solutions. And the best thing about AI solutions is that they can be tested. AI creates its own empirical feedback loop that allows you to think of your company as an experimental science lab for transformation and performance improvement. In other words, the hard science of AI can be just what you need to ask the kind of broad questions that lay the foundation for meaningful progress.